Federal regulators are pressing the Supreme Court to stop big pharmaceutical corporations from paying generic drug competitors to delay releasing their cheaper versions of brand-name drugs. They argue these deals deny American consumers, usually for years, steep price declines that can top 90 percent. 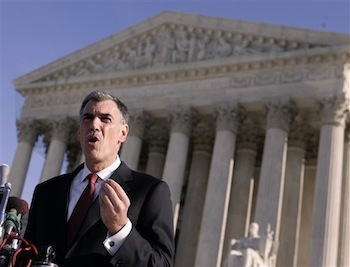 WASHINGTON (AP) — Federal regulators are pressing the Supreme Court to stop big pharmaceutical corporations from paying generic drug competitors to delay releasing their cheaper versions of brand-name drugs. They argue these deals deny American consumers, usually for years, steep price declines that can top 90 percent.